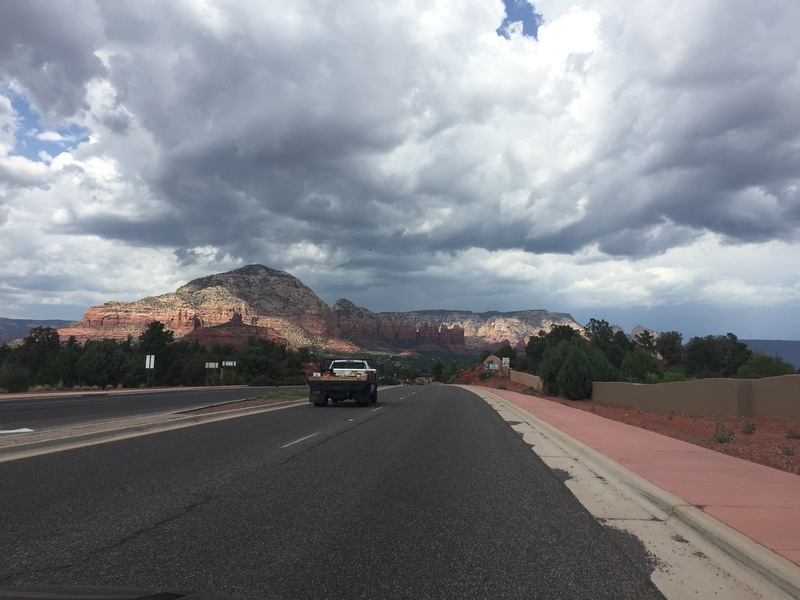 On our way into Sedona, the day ahead is to be spent entirely out in Red Rock country. Though I’ve been told Sedona is the center of the universe and cosmic healing, so I’m sure at some point we’ll go explore a cult as well. The temperature has dropped at least twenty degrees, to a nice cool ninety, and saguaro cacti grow in forests thousands strong. The area is beginning to turn lush again as we head north in the direction of Flagstaff and the Grand Canyon, forests of real trees line the roads from time to time, a truly welcome sight. However, beneath these trees lies no dirt, but rather a sand of deep reddish orange. The sidewalks are paved almost pink, making the most of the red rock surroundings, and the horizon is lined with gargantuan formations of the same reddish hue. Much like the red canyons of Utah, except much more spread out, and covered in forests. Hidden somewhere in the rock is Montezumas castle, dozens of ancient ruins, and apparently even a meteor crater. With rain on the way and due in at just 4:00, we’ve got a lot to see and not very much time to do it. The race is on to view as much of Red Rock country as possible, although who knows, we brought ponchos for a reason after all. More updates to come. In a repeat of our previous years jounrey through Arizona, we’re currently outrunning a monsoon of epic proportions as we blaze down the road towards Montezumas castle. Lightning strikes the tops of the mesas in the distance, a dark sheet of gray slowly eclipsing the sky. Sheets of rain can be seen shooting down from the sky off on the horizon, much like last year though, we’re staying just ahead of it. We’ve just set back out after a successful hike through Red Rock State Park, making it to the top of the Eagles Nest landing. Prickly pears and Ocotillos abounded as we walked through the deep red canyons of the park. Still waiting on the crystal healing though, hopefully we find some cult nonsense soon. More updates to come.